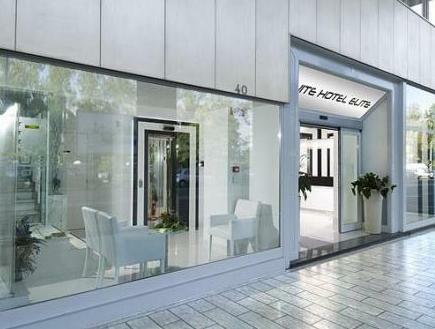 ﻿ Suite Hotel Elite Bologna. JIMAT di Agoda.com! Suite Elite Bologna adalah sebuah hotel reka bentuk yang bertaraf 4 bintang. Ia terletak dalam jarak 15 minit berjalan kaki dari Piazza Maggiore dan 8 minit pemanduan dari Lapangan Terbang Guglielmo Marconi. Bilik-bilik dilengkapi dengan Wifi percuma. Hotel ini menyediakan garaj percuma, dan tempat letak kenderaan persendirian yang terletak berdekatan. Bilik-bilik di Suite Hotel Elite berhawa dingin dan dilengkapi dengan perabot elegan dan lantai parket. Setiap bilik dilengkapi dengan sebuah TV skrin-rata 32, bar mini, dan bilik mandi en suite dengan peralatan mandian percuma. Hidangan bufet Eropah yang mewah disediakan setiap hari di bilik sarapan Sala Fellini, dengan minuman panas yang disediakan di bar. Semasa musim panas, para tetamu boleh menikmati sarapan mereka di teres Dolce Vita. Stesen Kereta Api Bologna Centrale terletak dalam jarak 2 km. Hospital Ospedale Maggiore berada dalam jarak 500 meter dari hotel ini. Bas-bas ke pusat bandar berhenti berhampiran dengan hotel. Sila ambil perhatian bahawa garaj tempat letak kereta disediakan atas dasar siapa cepat dia dapat dan tertakluk kepada ketersediaan kerana ruang letak kereta adalah terhad. I was upgraded to a bigger lovely room without asking. Staff is very friendly and helpful. Great value! Highly recommend. Large room but basic facilities and difficult to park even though it is advertised with parking (we arrived very late so spaces were all taken). Breakfast was good. Served us for what we needed (quick overnight stay before venturing into Tuscany). This quaint hotel for my wife n I is a gem hidden. A bit outside of the main town yet close enough by taxi or the city buses. The ladies at the front desk are helpful n have keen eyes, memory, excellent front service skills. The breakfast is great being it European, well stocked, generously served n greeted by employees. Cold clean rooms, well turned down every day. I shopped several sites, Agoda came through for me...again. We didn't expect to get a room with their own kitchen. The space was vary big. The location is easy to travel around as you have the main bus stations nearby. Highly recommended. The Room, the breakfast, the ease of getting around. Enjoyed Bologna and the Hotel very much. We had a junior suite and it was huge. The bathroom was awesome. The breakfasts were some of the best so far but a little squeezy. Of course it's little noisy with the windows open but it's double glazed and thick curtains work a treat. We were initially attracted to this hotel because of the photos. They are quite misleading. 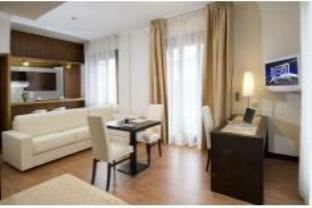 The lobby and facade of the hotel are true to the photos advertised however the rooms are not quite so. We were expecting a modern, newly renovated hotel room, when in fact we got quite the opposite. Sure there was a modern couch and television but everything else was outdated. The suite included a kitchen we never used. The room was dark and dreary and not happy and bright as that photographed. The bidet was also right in front of the toilet with just about 4 inches room in between. I also got an eerie feeling while in the bathroom. We initially booked 2 nights but checked out the morning after. If you are looking for a budget hotel for the family, this is it. Otherwise, don't bother. the room is not clean enough yet very spacious(junior suite). Standard of room is not very high, I expected better bedding and quilt. Furniture is quite worn out. Breakfast has large variety of pastries and cold cut, yet the pastries are too heavy for morning as they contain a lot of fillings(like all the pastries in Italy) Good value of money. I did not know taxi in Italy starts charging since you call, had a little quarrel with the driver. Hope hotel staff could remind visitors of this. Price is ridiculously high for the hotel during the fair period. And for such a price not even a free bottle of water offered. Only one English speaking channels. Would expect more. Abbiamo soggiornato due notti per girare la citta. grazie anche ai mezzi pubblici efficienti abbiamo raggiunto il centro con immediatezza. da notare le suite che hanno in dotazione! I stayed 6days. It was so nice to stay and breakfast was perfect. Especially Bread!!!! Thank you for hospitality during my staying. I will be there next year. Es un aparthotel en realidad. Las habitaciones son espaciosas, con vestidor separado, una kitchette y un baño con ducha bastante bien. Tiene 2 problemas: el primero es la insonorización. No se oye un ruido del exterior, pero la conversación de la habitación de al lado y la tele perfectamente. El segundo problema es que sólo tiene un ascensor con capacidad para 6 personas para un edificio de 8 plantas y en cada planta más de 15 habitaciones, de tal forma que para desayunar tardas más en bajar y subir que comiendo. Замечательная госциница. Завтраки вкусные, но очень маленькое помещение. Отдельное спасибо работникам рецепшена. Я забыла в отеле електронную книгу и обнаружила спустя 3 часа. Я позвонила в гостиницу и работники рецепшена мне сообщили,что моя электронная книга найдена и я могу приехать в любой день и забрать. Огромное Вам Спосибо.